A Christ­mas Day pleb­i­scite by the citi­zens of Saint Pierre and Miquelon, whose supply of food and other provi­sions from the Cana­dian pro­vinces had been cut off, voted 98 per­cent in favor of ad­hering to Free France and sacking their Vichy admin­i­strator. The one‑star Gen. de Gaulle had assumed for him­self the mantle of France-in-exile, and his auda­cious feat of arms off the North Amer­ican coast over Christ­mas 1941 was done, in the words of Brit­ish Prime Minis­ter Winston Chur­chill (he was in the States at the time), “in bad faith” because it was an unauthorized action launched from a “British dominion” (i.e., the Canadian province of Nova Scotia). De Gaulle’s blood­less coup de main was also done to pre­empt a pos­si­ble joint occu­pa­tion of the islets by U.S. and Cana­dian forces (Canada had an­nounced its inten­tion to land troops on the is­lands to pre­vent Ger­man use of the islands’ radio trans­mitter), as well as to pre­vent the islands’ forced “neu­trali­za­tion.” Indeed, ear­lier in Decem­ber an envoy of Presi­dent Franklin D. Roosevelt had met with the Vichy High Com­mis­sioner for French pos­ses­sions in the West­ern Hemi­sphere to dis­cuss terms for the neu­trali­za­tion of Saint Pierre and Miquelon, as well as Vichy’s Carib­bean colo­nies. De Gaulle’s coup off the North Amer­i­can coast under­scores why the French­man’s relation­ship with Roosevelt was never better than sour. 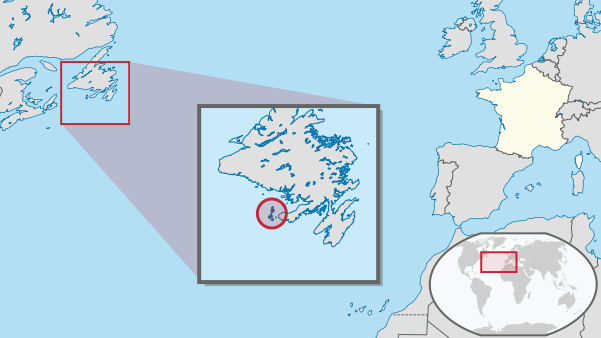 Above: Vichy France’s Saint Pierre and Miquelon Islands lay 12 miles off the Newfoundland coast of Canada and 2,373 miles from metropolitan France. Left: Appearing first on the world stage in June 1940 as a recently pro­moted French briga­dier gene­ral now in Lon­don exile, Charles de Gaulle quickly angered his Eng­lish host, Prime Minis­ter (since May 1940) Winston Chur­chill, and the Presi­dent of the United States, Franklin D. Roose­velt. Chur­chill, who described de Gaulle in mid-1940 as “the man of destiny at the hour of reckoning,” came to view de Gaulle as selfish, vain, an oppor­tunist, unscru­pulous, “ambi­tious to the last decree,” a man he sus­pected of having “fas­cist ten­den­cies.” Roose­velt viewed de Gaulle as suffering from delu­sions of grandeur, labeling him “well-nigh intolerable” and doubting for much of the war period that de Gaulle enjoyed the sup­port of the French people that he claimed. 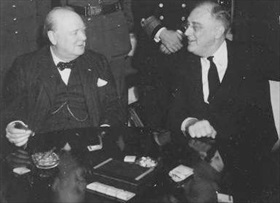 Chur­chill and Roosevelt are alleged to have plotted to remove de Gaulle as leader of the French Resis­tance at a critical moment in World War II. In May 1943 de Gaulle decamped from Lon­don to set up his Free French base in Algiers in North Africa, now finally freed of Pétain loyalists and the Axis military menace. 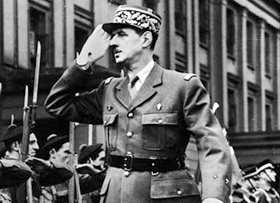 Chur­chill and Roose­velt side­lined him in the planning for France’s libera­tion (Opera­tion Over­lord), but de Gaulle out­foxed his two West­ern oppo­nents when he entered Paris on August 25, 1944, set up a provi­sional govern­ment (gouverne­ment provisoire de la République Française), and forced the Allied coalition to recognize him as France’s legitimate leader.